Some projects require the use of traditional CAD applications or renderering applications to develop construction drawings, photo-realistic images or to share information. SketchUp Pro can export your 3D model in a number of 2D and 3D formats for use with other applications. If you’re a Texas educator, then you are in luck! Licenses for individual Texas school lab networks (Windows and Macintosh). These licenses allow up to 300 simultaneous users on any given network. Licenses for imaging and installation on multiple laptops that need functionality both on and off of the school network (i.e. students with a laptop assigned to them). Licenses for stand-alone computers (Windows and Mac) for Texas educational non-networked machines. Please note that this is not a networked lab license, and will not run on a network. 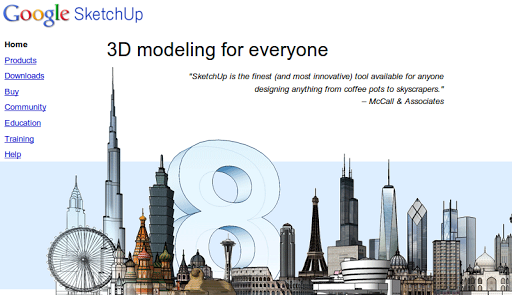 Update 09/26/2010: Check out this Teacher Guide to GoogleSketchUp!